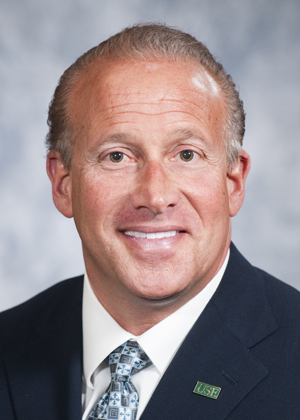 TAMPA, Fla. -- The University of South Florida announced today that its School of Mass Communications within the College of Arts and Sciences is now named after USF Trustee Jordan Zimmerman, the founder and chairman of Fort Lauderdale-based Zimmerman Advertising. The change was made official this morning by a vote of the USF Board of Trustees. The newly renamed Zimmerman School of Advertising and Mass Communications recognizes the USF alumnus for his gift of $10 million to the school, the largest gift to the College of Arts and Sciences in its history. The gift will put the school on the map globally to attract advertising and mass communications students. University officials held a special ceremony today to unveil the school’s name change. In addition to Zimmerman and Genshaft, Joel Momberg, chief executive officer of the USF Foundation and Eric Eisenberg, dean of the College of Arts and Sciences, spoke at the event. Eisenberg said the College of Arts and Sciences is extremely grateful for Zimmerman’s vision and support. Today’s announced gift is part of the $1 billion USF: Unstoppable Campaign. Momberg said Zimmerman’s philanthropy serves as a powerful example of giving back to the next generation in one’s own profession. Zimmerman has been a longtime supporter of the advertising program at USF. In 2002, he endowed a scholarship for advertising students, and he established an endowed professorship in advertising in 2006. Zimmerman’s unwavering commitment to providing USF students with the best advertising education is evident through cutting-edge classes he’s designed with USF faculty. Top executives from Zimmerman’s agency can be found each week in the fall on campus teaching students the most up-to-date advertising strategies. The newly re-named school bearing Zimmerman’s name already is known for the Zimmerman Advertising Program (ZAP), a joint effort between the College of Arts and Sciences and the Muma College of Business. Founded by Zimmerman in 2005, this unique program immerses students in the world of advertising by housing them in the ZAP Living Learning Community on campus while working toward a business degree and a master’s degree focused on advertising analytics. “This transformational gift will not only help the advertising program, but it also will propel our multimedia journalism, broadcast production and public relations programs to new heights,” Eisenberg said. In April, Zimmerman will be honored by the Horatio Alger Association of Distinguished Americans. Zimmerman was selected for membership in this prestigious organization that honors the achievements of outstanding individuals and encourages youth to pursue their dreams through higher education. Since its establishment in 1947, the Horatio Alger Award is annually bestowed upon renowned leaders who have succeeded despite facing adversity, and who are committed to philanthropy and higher education.